A fantastic single-player campaign and rock-solid multiplayer make this the shooter to beat this season. Welcome to 2016: the Year of Hype. Hype is the fuel that’s powered the video game industry this year, and it’s often powered us right into some nasty brick walls. What if hype isn’t always wrong? What if, against all odds and common sense, the media buzz and word on the street is entirely accurate? Sometimes that happens, believe it or not. For instance, you’ve probably already heard about how great the single-player campaign in Titanfall 2 is. News outlets and social media have all been abuzz about how it’s the best thing since Half-Life 2, which is obviously hyperbolic nonsense…but it actually is pretty decent and it’s easily one of the best we’ve seen in the past few years. You’ll play as Jack Cooper, a member of the Militia fighting against the oppressive IMC. When Cooper’s mentor is killed, he inherits ownership of the Titan BT, an artificially intelligent mech that helps Cooper survive in ongoing efforts against the IMC. The plot is fairly standard video game sci-fi – the banter between Cooper and BT is cute, but not all that original – it’s the level design where the campaign really shines. Cooper is a highly mobile character with his wallrunning and boosting capabilities and each stage is designed to highlight this; at the same time, taking direct control of BT and smashing around is equally satisfying. One early stage in particular, a factory designed to crank out simulated settlements for training exercises, is especially immersive and serves as some of the best shooting action I’ve enjoyed in years. Later stages toy with the FPS formula a bit, such as one mission that’s all about flipping between two versions of the same stage to make progress and win battles against impossible odds. Titanfall 2’s solid gameplay helps tie everything together. Modern shooters have done a really great job of solidifying the act of firing a weapon into an enjoyable micro-experience; in other words, it feels really, really good to shoot baddies in these games. Jack Thompson would be horrified, but it’s true. The weapons in Titanfall 2 have a solid, realistic sense of weight behind them. It’s immersive, perhaps even more so when you’re taking advantage of your character’s advanced mobility options to take out hordes of enemies at a time. That’s saying nothing of the power you’ll wield in a Titan, which feels like a whole different game entirely. Titans are now separated into different classes based on their loadout, which helps distinguish one Titan from another a little more than in the first game. These range from a fire-blasting option that can lay napalm traps to a floating sniper loadout to the mighty sword-wielding Ronin. Your choice of Titan feels like it makes a much more significant difference than it did in the original game. It’s good stuff all around, and I appreciated the ability to switch BT’s loadout on the fly in the campaign mode. Multiplayer is excellent as well. 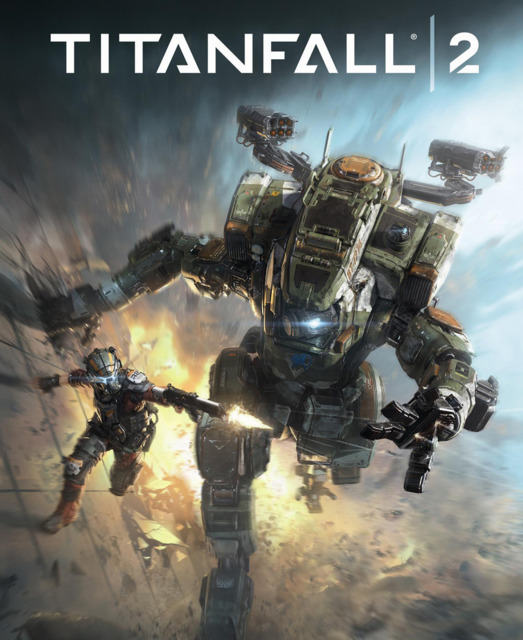 The highlight is Attrition, essentially the same game mode as the original Titanfall, where players battle other players and AI to try and reach a score limit first. This allows even less skilled players to contribute to their team by taking out AI, which is a far cry from the meat grinder that’s usually presented to new players in modern shooters. Other modes include Bounty Hunt, where you’re given specific targets to take down, a pilot-only battle mode and the Coliseum, where victory is rewarded with new customization options. There’s been plenty of doom and gloom around the ‘net about how this game doesn’t have a strong playerbase, but I never had any issues getting into any game mode I felt like playing, so that might be some hype to ignore. The original Titanfall was one of my favorite multiplayer shooters thanks to its smooth, free-flowing action and addictive gunplay and this one looks like it’s going to continue the legacy. If I had any complaints they’d be about the standard progression system that’s applied to pretty much every multiplayer shooter these days; do I really need to work my way up to using the guns I want yet again? That’s not the end of the world, though, and it’s hard to complain about a game that wants me to spend more time playing it. There are few things I like more than raining on a hype-fueled parade, but in this case I can’t really deny that Titanfall 2 is a really great choice for shooter fans. We’ve seen a glut of big-name FPS titles drop this season and they’ve all been surprisingly great choices, each excelling in different ways – namely Battlefield 1’s presentation and setting, Call of Duty: Infinite Warfare’s rock-solid production values and TF2’s excellent single-player campaign. Each is worth checking out. If you can only buy one, however, Titanfall 2 is probably your best option. I never thought I’d say this, but believe the hype.